The Thatcher Sofa is our transitional interpretation of a classic. Plush cushions offer wide seating for optimal comfort. 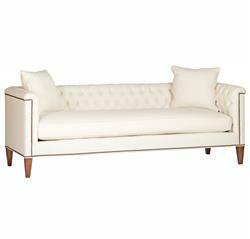 The low, tufted back and high arms exude modern style. And the nail head trim and exposed wooden legs make the piece interesting.